Ownership / Access: Castle open to the public. Notes: Walden Castle was a medieval castle in Essex, England, built during the Anarchy of the 12th century.Walden Castle was built in the town of Saffron Walden in Essex at the start of the civil war known as the Anarchy by Geoffrey de Mandeville, with much of the work occurring between 1141 and 1143. It was one of several castles built by de Mandeville to reinforce his power across the region.The castle stood on a natural high point within the town (grid reference TL539387) and had a square Norman keep and bailey wall, forming a substantial fortification. Geoffrey de Mandeville was arrested under questionable circumstances by King Stephen in 1143, and ordered to hand over his castles, including Walden; de Mandeville initially agreed, but reneged on the agreement once released and launched a military campaign against the king's strongholds in Cambridgeshire in an attempt to free the route south to Walden.Geoffrey de Mandeville died during a siege the following year, still not having reclaimed Walden. Henry II ordered the castle, with the keep probably still unfinished, to be slighted in 1157. Saffron Walden's streets are shaped by the outline of the castle bailey. 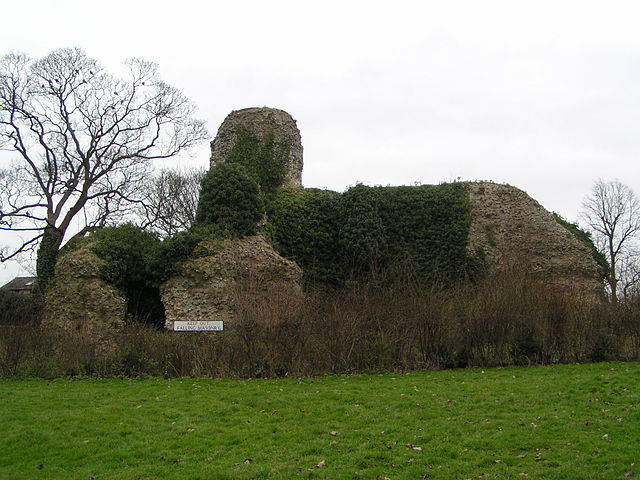 Only the ruined core of the castle remains, with most of the stones stolen over the intervening centuries; the castle is a scheduled monument and a Grade I listed building.